Not that it was a bad wait by any means. The six of us had just finished hiking Jochberg, a 1565-meter peak that overlooks two lakes and offers an impressive view of the nearby Alps. After this steep, but extremely pleasant ascent, we paused for lunch near the top at a little local café surrounded by cows. 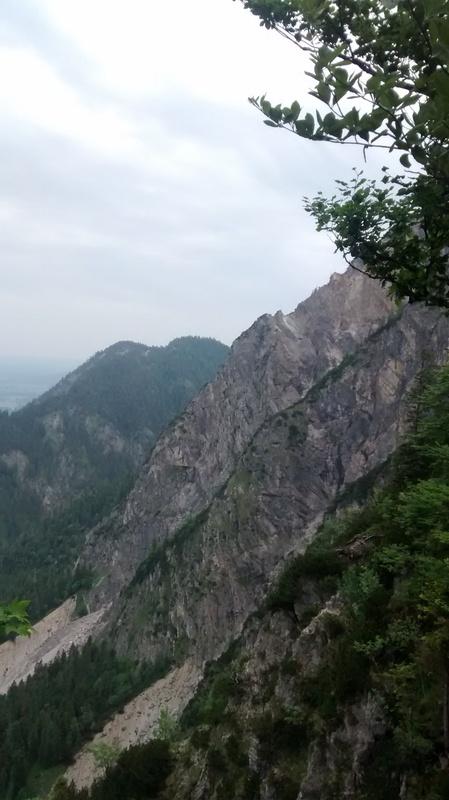 We decided to be adventurous and try a different way down (it was slightly steeper at points, and I slipped a couple of times), which brought us to the edge of Walchensee, one of the lakes we had seen from above. It didn’t take us long to decide that we wanted to jump into the crystal clear water, and despite the lake being a little chilly and the shore a little rocky, it was the perfect way to relax after our hiking excursion. Eventually, we decided to continue on our way back to town to catch the bus only to find that it wouldn’t come for another hour and a half. So naturally, we got ice cream and relaxed at the local café on the lake. View from near the top of Jochberg. 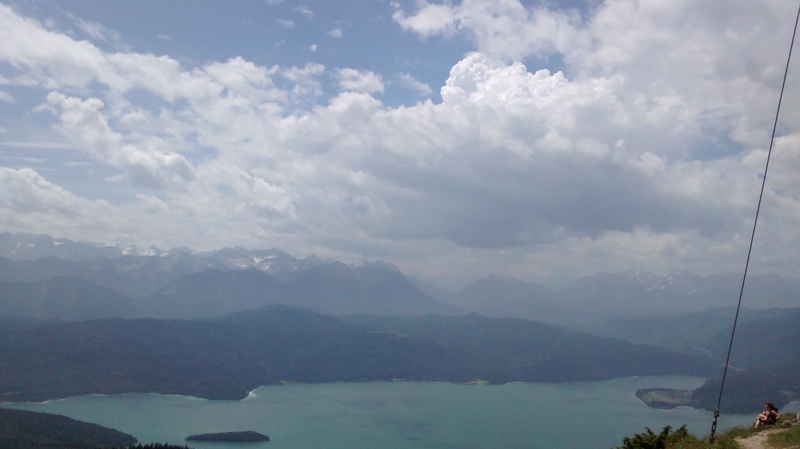 Walchensee is on the left and Kochelsee is on the right. So yes, hiking in the Shenandoah Valley will now feel a little empty without the beautiful blue lakes and the Wanderhütte (literally “hiking cabins,” but basically the family-owned cafés along the hikes). But wherever I go, hiking up a mountain is still one of my favorite activities. It’s very refreshing to be out in nature; it creates fun memories with friends, and it also gives me time to think about what I’ve been learning over the past few months. 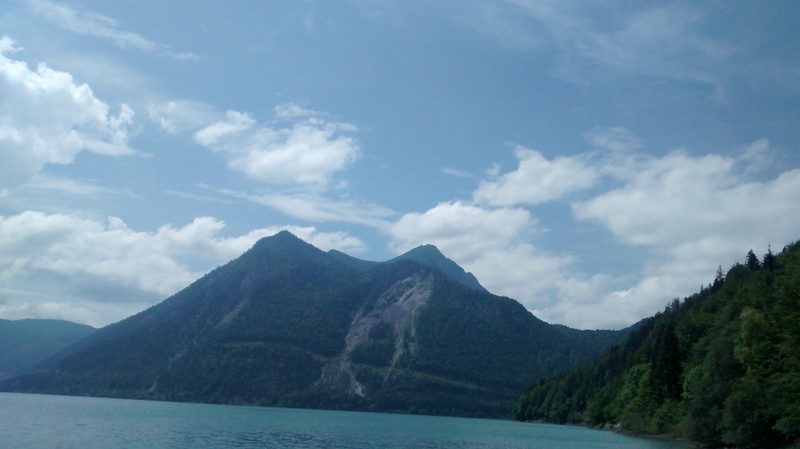 Walchensee, an absolutely beautiful alpine lake. For example not being afraid to move out of my comfort zone. I needed a book as a source for my presentation, and it happened to be in the city library. Munich has several different library locations, so I looked up which building housed the book and also how to get there. I had to take the bus, which I’m not used to, but I found out that I actually really like the bus because I was able to see more of Munich. After wandering around the beautiful streets in the rain, I finally arrived at where the library building was. Except it’s currently undergoing renovations, sooooo no book. Not to give up, I went to the main library building, timidly walked up to the information desk and asked for help finding my book. I was then directed across the street, where I acquired a library card and finally ordered the book. I almost quit and almost didn’t even try because the whole process was so unfamiliar, but I’m really glad that I did because I was able to explore Munich, get a library card, and have a better source for my presentation. Every new day has the opportunity for new experiences. I’m always tempted to “play it safe” and stay within what’s familiar. And I’ve had plenty of “ordinary” days in Munich, when I haven’t tried anything new or I’ve simply relaxed in my room. But when I do venture out, I remember that the world is a much bigger place than what I see and experience in my daily life, and there is so much more out there to explore and learn. Impressive side overlook from along the Jochberg hike. When I was little, I remember telling my dad that I knew how to add, subtract, multiply, and divide. What more was there to learn about math? Obviously, algebra would shortly prove me wrong, and years later, AP Calculus assured me that math was definitely more complex than I could ever understand. Like I mentioned last week, the more I learn (about Munich and German culture, or in my classes or through conversations, etc. ), the more I realize how much there is left to learn. Taking new trips and trying new things can turn “my world” upside down, but so can simple questions or observations, if I’m open to it. And while that can be uncomfortable and scary, I’m trying to remind myself that taking the risk and leaving my comfort zone leads to invaluable learning experiences. At least it has so far. The peaks of the Alps are in the distance.